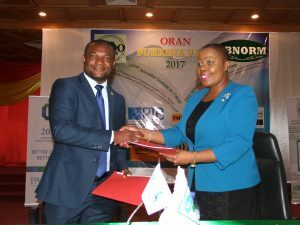 The 23rd General Assembly of the African Organisation for Standardisation (ARSO) marked a milestone achievement in INBAR’s effort to promote bamboo and rattan standardisation in the world and in Africa. At this event, ARSO and INBAR signed a Memorandum of Understanding, which provides a framework for cooperation between INBAR and ARSO on standardisation and conformity assessment activities in advancing the bamboo and rattan trade. This Memorandum bears great potential for a number of reasons. ARSO and INBAR have 15 common Member states in Africa. In addition, ARSO plans to launch the Africa Free Continental Trade Agreement which aims at eradicating all non-tariff trade barriers within the African continent. Bamboo and rattan commodities could see real benefit when this Agreement is launched. In general, the bamboo and rattan industry is growing fast in Africa. There are an estimated 3 million hectares of bamboo growing in the continent, with huge potential to make into sellable commodities, for use in land restoration schemes, or as a renewable source of bioenergy in the home. South Africa is one of the top ten exporters of bamboo flooring and woven rattan products in the world; major new industries are growing in countries like Ethiopia and Ghana; and numerous countries are introducing bamboo into their policies, national guidelines and regulations. Despite this, bamboo and rattan industries have yet to reach their full potential in Africa. China, by comparison, has 6 million hectares of bamboo (Forest Resource Inventory, 2015) but boasts an industry worth USD 30 billion (INBAR trade statistics) and employs almost 10 million people (State Forestry Administration, 2012). Standardisation – to ensure a consistent standard, safety and quality of products – is a key way to tackle current barriers to market expansion, and help bamboo and rattan become strong pillars of Africa’s future green economy. Dr. Eve Gadzikwa, ARSO President, quoted “we are proud to build this partnership with INBAR, and we are confident that this is the best way to go to foster bamboo and rattan standardisation in Africa. We are looking forward for a fruitful collaboration with INBAR.” As are we! Besides the MOU signing ceremony between ARSO and INBAR, several ARSO-INBAR common membestates expressed their willingness to participate in the development of bamboo and rattan international standards within the scope of the International Organisation for Standadisation (ISO) Technical Committee (TC) 296—Bamboo and Rattan. These memberstates includes, Nigeria, Ethiopia, Ghana, Kenya, and Rwandan. It is envisage that, in the near future African countries will play an active role in the ISO/TC 296.